Save $500* on a Disneyland® Resort vacation package with a 4-night hotel stay and a 4-Day Disneyland Resort Park Hopper® souvenir ticket. This package gives you the time to enjoy two amazing Theme Parks filled with favorite attractions, shows and more. Offer Details:Save $500 when you buy this 4-day, 4-night vacation package that includes a 4-Day Disneyland Resort Park Hopper souvenir ticket and a 4-night stay at one of the Hotels of the Disneyland Resort. Booking & Travel Windows:Book this offer Nov. 1, 2011 – Feb. 26, 2012, for arrivals most nights Jan. 2 – Feb. 26, 2012. Travel on this offer must be completed by March 1, 2012. 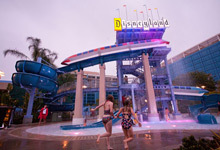 Bonus Offer:When you check in at one of the three Hotels of the Disneyland® Resort from Jan. 4 to Feb. 29, 2012, each person in your party will receive two Disney's FASTPASS® tickets, per stay. Combined with valid theme park admission, it's a great way to make the most of a Disneyland® Resort vacation!